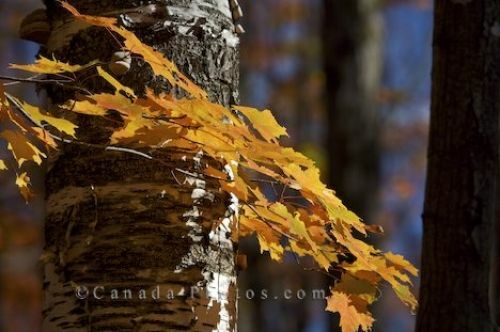 The Autumn colored leaves embrace the bark on a tree along the road to Rock Lake in Algonquin Provincial Park in Ontario, Canada. The yellow and orange Autumn colored leaves cling close to the trunk of a tree along the road to Rock Lake in Algonquin Provincial Park in Ontario, Canada. The entire forest is aglow in various hues, as Autumn has taken over the forest creating a picture of beauty. These leaves in the foreground are still very much intact on their branches, while some of the trees in the background have already been stripped of their Autumn colors. Picture of the Autumn colored leaves in the forest on the road to Rock Lake in Algonquin Provincial Park in Ontario.